Today is the birthday of Sir John Betjeman, a 20th century poet who actually wrote in verse. Not free verse but lines that rhymed. 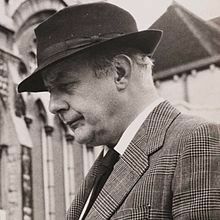 Betjeman (August 28, 1906 – May 19, 1984) was popular in his time. His Collected Poems, published in 1958, has sold over two and a quarter million copies, according to Betjeman.com. It doesn’t take a literary rocket scientist — or whatever brainy literature lovers are — to appreciate his poems. If you are occasionally wry, sardonic, wistful, nostalgic, fed up with progress and modernity, like a bit of open air and girls, you may enjoy some of his poems. My favourite is A Subaltern’s Love Song, but here are a few more. The Olympic Girl is in a similar vein, and then there is the unpronounceable, adorable Myfanwy. In A Bath Teashop is short and sweet, Winter Seascape exhilarating. Very different is Loneliness. Then there is the social commentary. Born at the turn of the 20th century into a changing world, Betjeman found lots to rue and rail against, but in eminently readable verse. The lines rhymed, memorably. And wrinkles her retrousse nose. I have a Slim-line briefcase and I use the firm’s Cortina. The maitres d’hotel all know me well, and let me sign the bill. And basically I’m viable from ten o’clock till five. I’ve a scarlet Aston Martin — and does she go? She flies! And thunder under in a cave. Behold a huge consoling sea.